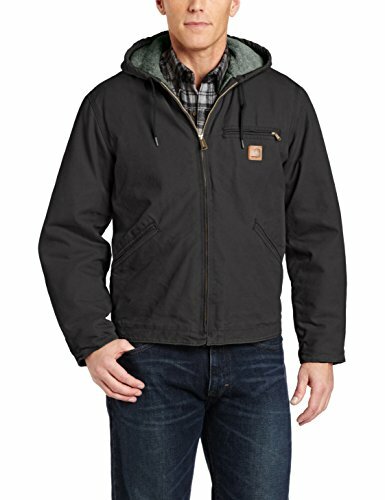 Keep the cold at bay with carhartt's sandstone sierra jacket. For warmth, it features sherpa lining in the body and hood, while the sleeves are lined in quilted nylon. It's built tough with 12-ounce, 100 percent cotton sandstone duck. Rib-knit storm cuffs help keep the cold out. There are two interior pockets, two exterior pockets, and a left-chest pocket that zips shut. The main seams are triple-stitched for extra strength, and the bi-swing back design and pleated elbows add comfort.